Zoo With Roy: First photo submission: Penguin head tucked jersey guy! 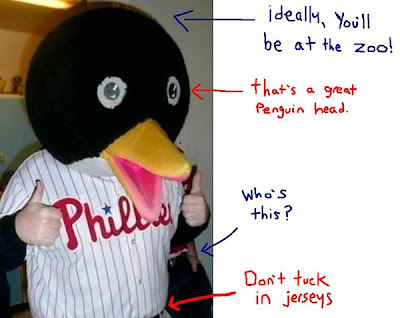 First photo submission: Penguin head tucked jersey guy! So we have our first response to the "ZWR meme" posting, and it's not bad (though not quite perfect if we're being honest). It came via Twitter, and shows a ton of spirit--which ultimately is appreciated enough to get it recognized now in bolg post format. But rather than try to write out rules or anything of what the ideal photo submission must contain (I mean, we're not exactly This American Life yet) let's, for the sake of the community, just take a look and see where the work lies. If you want to your zoo/animal/phillies/thought bubble picture featured on Zoo With Roy, please submit them, along with a self addressed stamped envelope (SASE) to zoowithroy@gmail.com. And as always, feel free to also twiddle us.